Groups Attending: Swimmers from Gary and Senior groups are eligible to attend. Timer Assignments: VISITING TEAM TIMER REQUIREMENTS – Saturday and Sunday AM sessions. 1 end each AM prelims, and Afternoon sessions as well as Head timer positions. Cincinnati Marlins will provide watches. responsibilities. Coaches will give more information on assignments closer to the meet date. Keating Natatorium is an 8 lane x 50 meter indoor pool with a removable bulkhead in place to make two 25 yard competition pools. The competition course has been certified in accordance with 104.2.2C(4). The copy of such certification is on file with USA Swimming. Water depth is 6ft. from the balcony (South) end of the pool to 4ft. in depth at the Scoreboard (North) end of the pool. Seating is limited and will be conducted on a first come first serve basis. Seat saving techniques such as towels, bags, etc are not allowed. PLEASE no flash photography as this interferes with the swimmers start off the strobe starting system. No coolers or glass containers are permitted in the natatorium. Swimmers bags are not permitted in the spectator seating. 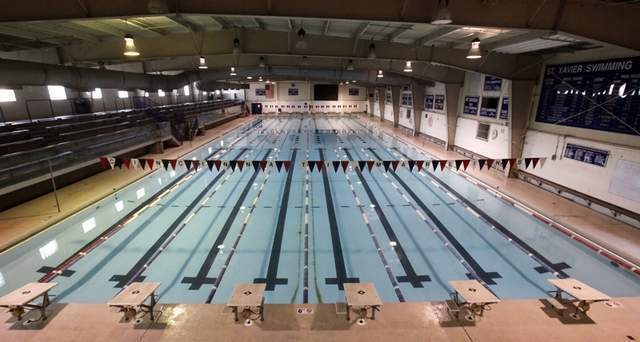 No towels, bags or personal belongings may be left in the natatorium between sessions. For your safety and the safety of others exit aisles and exit ways have been marked and must remain clear at all times. The gym MAY be available for swimmers and parents to utilize chairs, bags, and coolers. We will post availability in Meet Notes before the meet. miles). St. Xavier High School is on the right and Keating Natatorium is behind the school.